The opening moves of this battle left me completely humbled by the friction and subtleties of command. This is a continuation of the previous entry where I edited a battle from scratch. Quick refresh: a company-sized team of German PzIVs and PzGr. 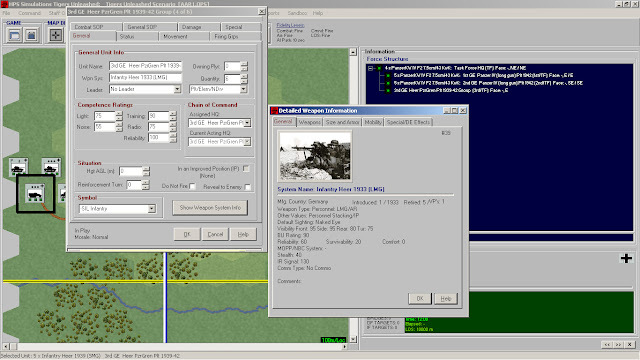 against a computer controlled Soviet infantry battalion reinforced with a company of AT guns. 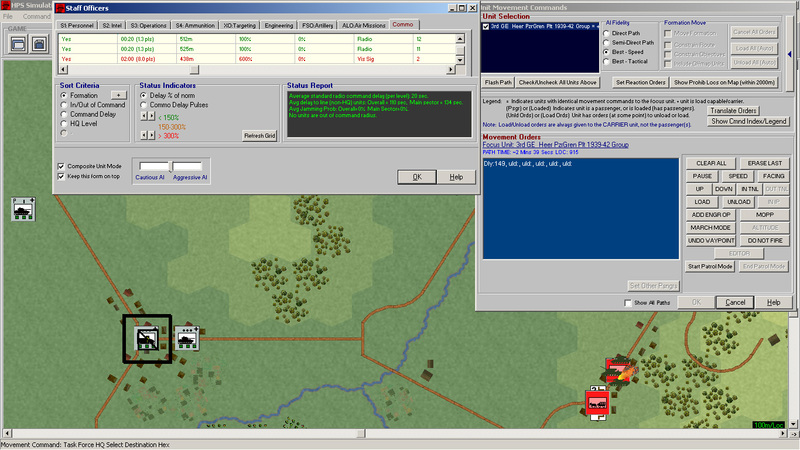 The battle is unfolding and the simulation is showing more data that I can shake a mouse at, but that window that displays my tactical shortcomings is painfully missing. I want to start this entry with the importance of reviewing your troops before going into battle. Not only what is their composition in men and weapons, but also how the chain of command is sorted. There is plenty of data to go through and you may be a bit overwhelmed. Just make sure that the weapons systems are what you think they are and that their numbers are what you expect. 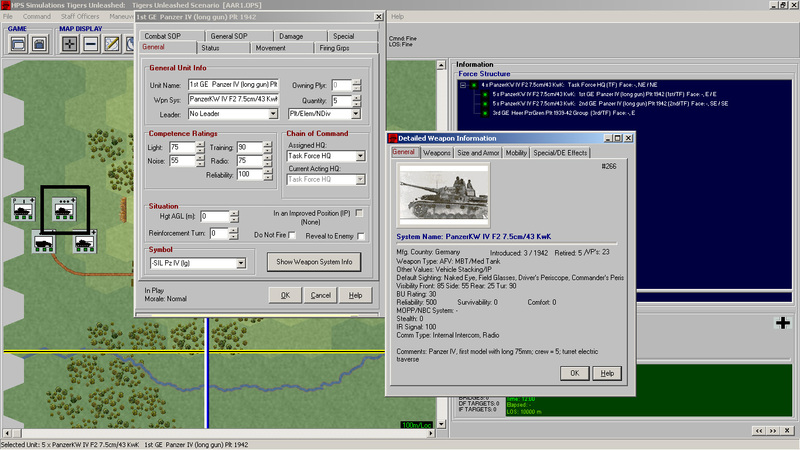 These are two unit information windows for a platoon of PzIVs. This platoon has 5 tanks: note how that information is shown in the left window in a very tiny field named "quantity". The German infantry unit is a so-called "composite" unit (many units consolidated into a bigger unit). In this case, you can cycle through all the units within a composite unit. In the screenshot above, all LMGs of the platoon are a single unit. Reviewing your troops is very important for mechanized units. The infantry composite unit mentioned above has 5 halftracks, and you need to check if the troopers are mounted in their transport or not. In my case I had to load the infantry into the halftracks. Unfortunately, the simulation doesn't show the loading status in the icons on the map, and it's not rare to have a full platoon of mechanized infantry (including transports) crawling at 5 km/h just because all the infantry is (unknown to the player) dismounted. Loading is relatively simple. Click the unit, click the transport and then click the "Load Group" button. The simulation takes care of all the details like the transport capacity and others. To establish contact with the enemy, I wanted to move my troops forward in a way that would leave them in a very good position to attack the first objective. Opening moves (the squares are the ordered moved paths for my units). 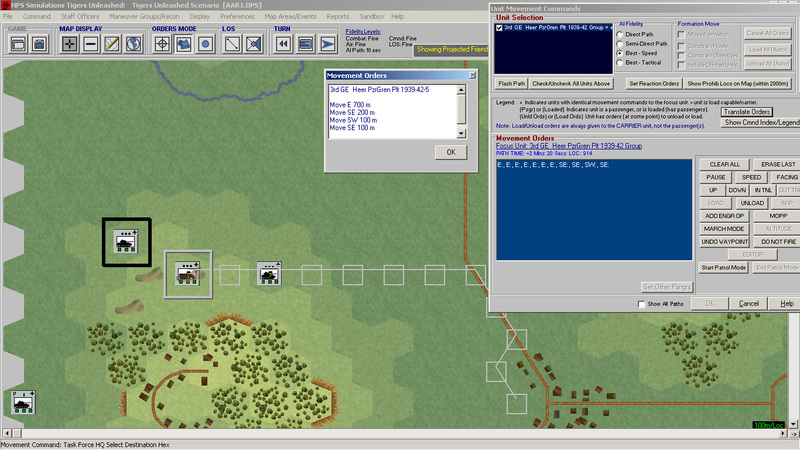 A, establish a support/attack by fire position with a platoon of MkIVs, oriented towards the objective (not shown in the map, northeast of A). B, this is hill with a light woods patch where enemy troops were reported by the intelligence officer. I am sending a platoon of MkIVs and the (mounted) PzGr. platoon to the village labeled "C". They are to establish contact, develop the situation and determine if the wooded patch is a good approach for a future attack on the objective. My forces are rolling out. Note how the PzGr. platoon (highlighted with a grey square) is behind a PzIV platoon. This is because the PzGr. platoon took one minute and a half to load into their transports. Now that the bullets are flying, it's a good time to talk about manual targeting. 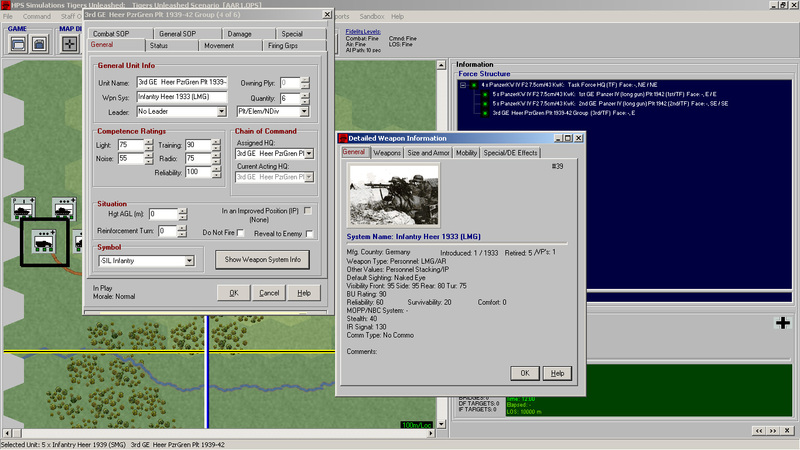 Your troops will automatically fire once in contact or fire back when fired upon. It all depends on the SOPs that the player sets for the unit. However, the player can manually adjust the targets of a unit. 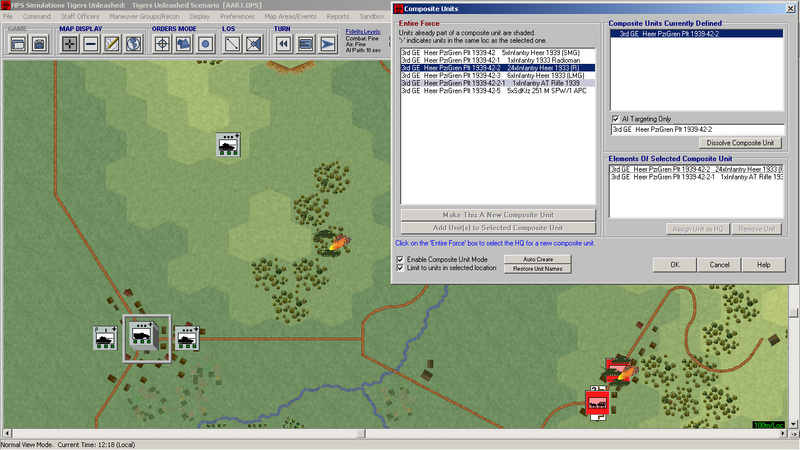 In this screenshot, I am making sure that the tank platoon (unit surrounded by a black box) is targeting the position where we received fire from. Note the shaded out areas in the map. These are locations that can't be targeted by this unit. But actually, something worries me more than targeting. The mounted PzGren platoon is slacking to reach the their forward position. 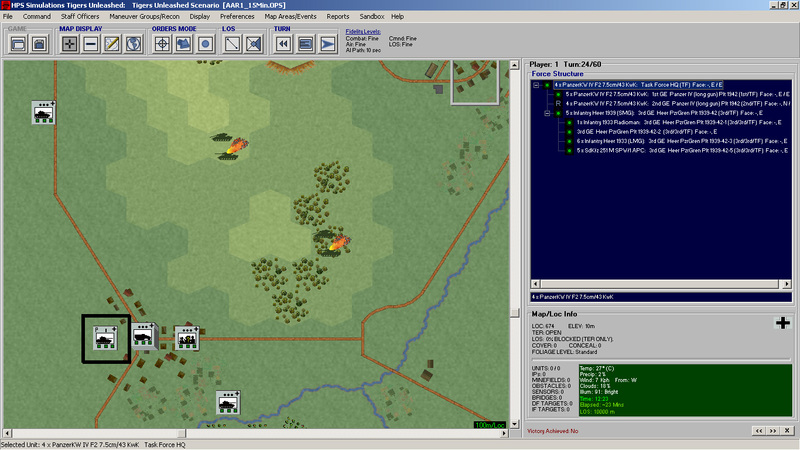 They have received enemy fire and now they are struggling even to change formations. A quick check of their communications status reveals that they are out of radio contact. Super! 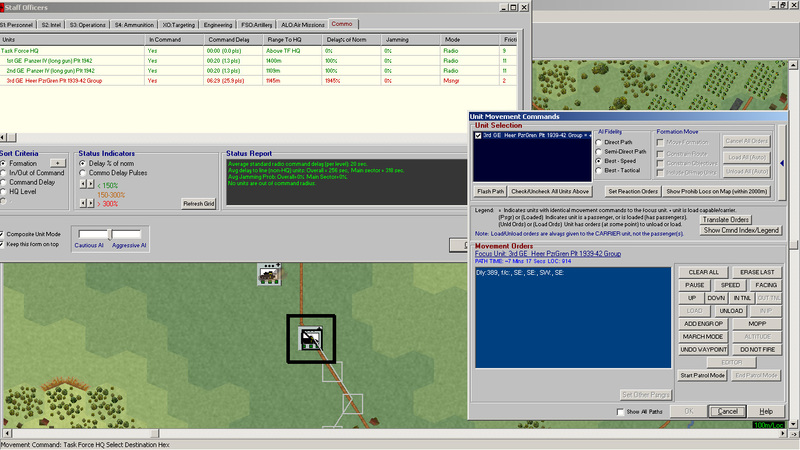 A couple of windows showing the status of my PzGren platoon (with the black box in the map). 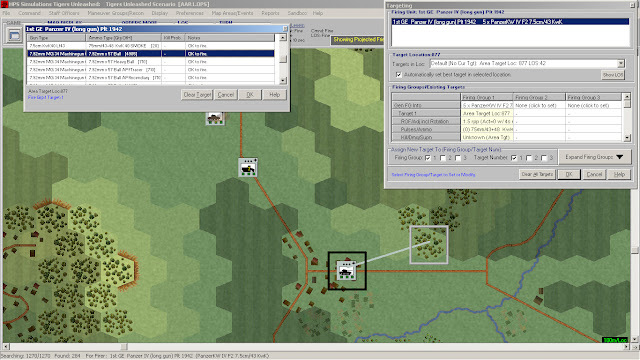 Top left: communications status, all units are in radio contact but the PzGren platoon who can be reached only by messenger. Bottom right: movement commands, I ordered the platoon to alter its original path and they will, just after some 6 minutes of delay! "Dly:389" in the light blue info field of the bottom right window means this unit will have 389 seconds of delay before starting to execute your orders. Yikes! If the only way to reach the PzGren platoon is by messenger, I better move the task force HQ unit way close to them. Command from the front, they say ... Well, not so easy in my case. 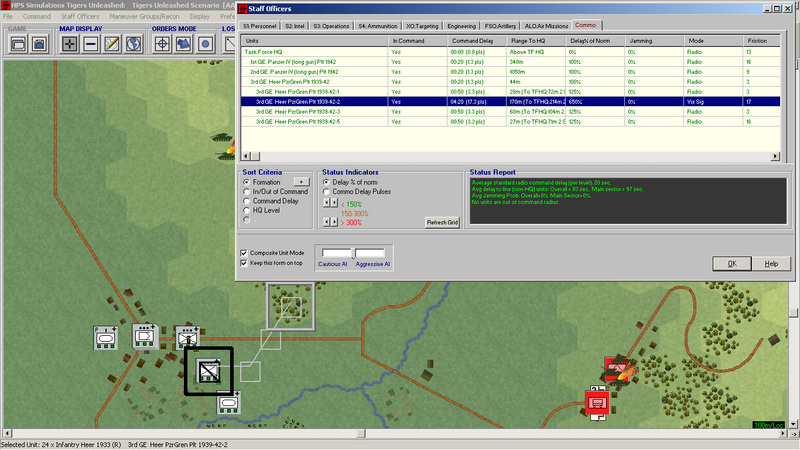 My task force HQ unit stopped moving forward after a couple of hundred meters. It took me a little while to find out why the task force HQ was not moving forward: in the SOP settings, I checked a field that says "Keep HQ Units behind", or something like that. With the task force HQ unit near the real action, the delays of the PzGren unit decreased significantly. In the screenshot below, I've ordered them to dismount ("uld" in the info panel, bottom right). The PzGren platoon (selected, black box) is dismounted. Now they can be reached by visual signals from the task force HQ unit which is shown in this map some 400 meters north west. In the previous screenshot, I am sure you noticed red icons and burning wrecks located east of the village where I am deploying the PzGr. platoon. 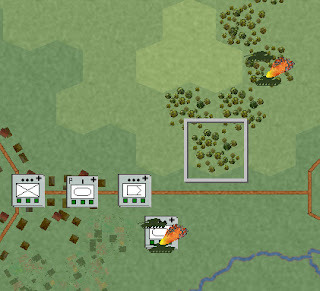 The tanks are putting a good amount of fire against transports and the occasional AT gun at several positions in the map. I'm so absorbed with the PzGr. platoon that, as far as I don't loose a tank, I just let the engagements go their way. And now, having dismounted my PzGren. platoon, the moment of foolishness that I regret. I wanted to clear the wooded patch with my infantry and I thought that the best way to do this is to have as much fire support as I could muster. So I decide to split the infantry platoon into a command group (radioman and platoon command team), a fire support group (all LMGs) and an assault group (24 grenadiers). Mixing, matching and messing with the composite units dialog window. You can do pretty much whatever you want, but watch out for your command structure. I can't blame the simulation engine for what I have done. My most critical mistake was to keep the command group in the village while leaving the fire support and assault groups to themselves. When it rains, it pours. While dealing with all these command issues, we suffer our first tank loss. A tank in the platoon that was occupying an attack by fire position overlooking the objective is destroyed by a Soviet AT gun. As per SOP the rest of the tank platoon retreats into cover. 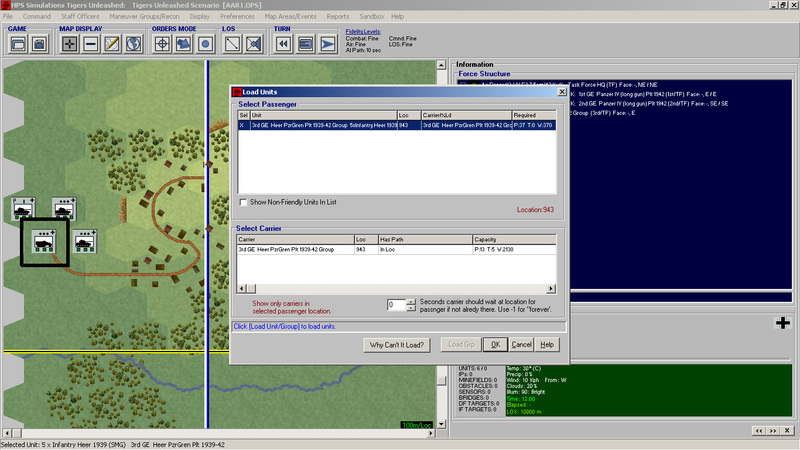 The grey box is the southern extreme of the objective village. 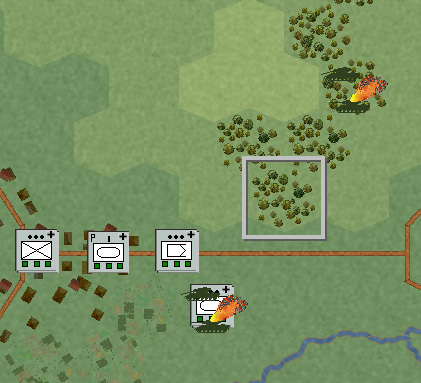 After taking a loss, the tank platoon west of the grey box puts a hill between itself and the incoming fire. I can only hope that the assault on the wooded patch goes well. The assault group (24 grenadiers, highlighted with a black box) and their movement path (grey squares linked by a grey line). Their communications status is by visual signals, and their delay to implement any orders is around 4 minutes. 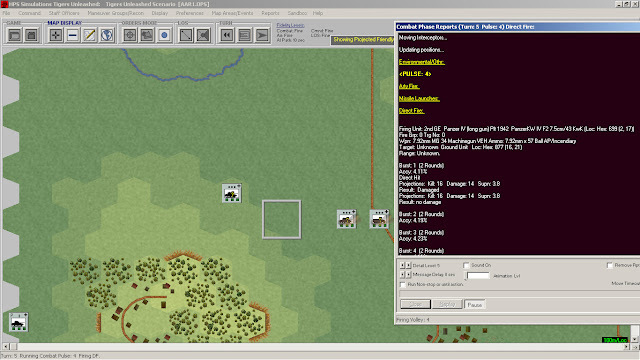 The fire support group (LMGs, unit icon has a question mark) is still moving out of the village to support the assault. I also have a tank platoon in a fire support role. It is located south east of the assault group. Stay tuned. More is coming up. Looking forward to seeing how the infantry fair in the woods.. excellent write up - finally adding a level of interest to a game that presents pertinent tac info in a myriad of dialogue boxes!! What do you think of the Out of Eight Review?